Trouble is my parent's ten year old female Schnauzer. She was rescued in Las Vegas where I was living at the time and my parents took her to her up to Canada. Except for a bladder stone surgery and allergies, she has been healthy. A month ago she was diagnosed with a liposarcoma on her left front leg. This is a type of cancer that is locally invasive. In other words, the risk of it spreading to other parts of her body was low but she was still in a degree of pain; she hobbled around mostly on three legs despite being on two types of pain medications. There was considerable debate in our family about what to do. Obviously an amputation was going to be a major surgery but had the chance to be a cure. On the flip side, she is an older dog and perhaps the cancer had spread beyond the leg without us knowing about it. As always, there was the issue of cost. An amputation can run $2000 or so. In the end, the amputation won out. Everything went well with the surgery and we will be picking her up today for home nursing care. I think she will do fine. 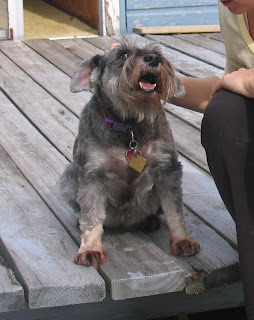 She's a Schnauzer, she's not ancient and her uncle is a vet; what more could she have in her favor? ?